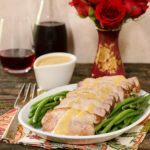 A recipe for Pork Roast with Peach Moscato Sauce. A boneless pork loin roast is seared then braised with peaches, Moscato wine, and onions. Heat oil in a braiser pan or dutch oven over medium-high heat until almost smoking. Add the pork to the pan and sear to brown on all sides, about 2 to 3 minutes per side. Reduce heat to medium and add onion. Cook until onions have softened, about 3 minutes. Return pork to the pan along with peach slices and wine. Cover and place in the oven. Put peaches, onions, and all pan juices in a blender. Blend until liquefied and pour sauce back into pan. Bring sauce to a simmer then reduce heat to low to keep warm until serving.